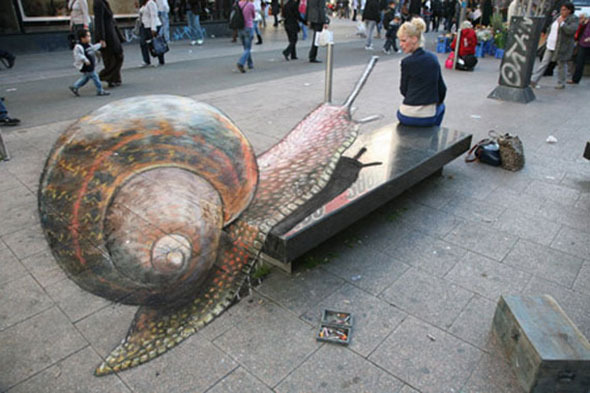 Giant Snail Attacking a Woman! This photo was taken somewhere in Europe, and I can’t believe I never saw it before – specially since the author behind it is one and only #Julian Beever, master of 3D pavement art. What you see below is a street and a plain stone bench occupied by an ordinary citizen and one unordinary creature. Both pavement and bench are partially covered by a chalk drawing. The drawing disappears in places, and at one point seems to bump into a metal pole. What I find so interesting about this anamorphic painting is it’s seamless transition between flat pavement surface and a bench. But I guess this all makes sense when you see it from another angle. Both photos are included! Prev Two Headed Zebra Again! i just love looking at these paintings. I also like the ‘integration’ of the little metal pole on the pavement as an antenna. Sprinkle a little salt on it. That should take care of it. Works in my garden anyway. That is pretty awesome, and using the metal bollard as part of the artwork is a great addition to the usual illusions of this type! Without the second shot I would have had trouble believing my eyes. This ist PHANTASTIC!!! This is really good! I thought I’d be tired of these, but this one really pushes the envelope. Now I know what is eating all my garden plants – that is not a Julian Beaver picture I want to meet, fan though I am of his works. That is extremly well done- it must be hard to blend in the bend so well- and its very clever to position it to use that pole as one of the snails antenae. pretty damn cool. A lot of thought and talent there. i can draw pretty well but i can’t do it in chalk, mosty because you can’t erase. 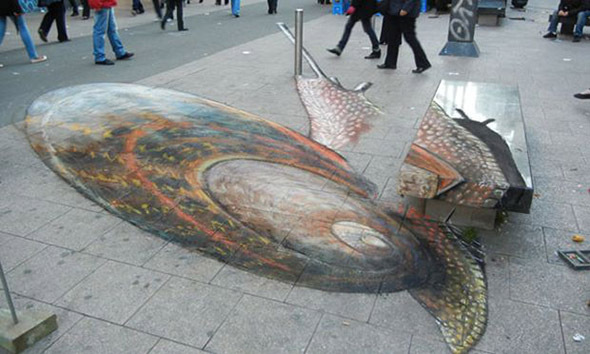 This picture of the giant snail was made by the artist during Fall 2011 in a busy pedestrian shopping street in Brussels. Thanks for the second vantage point. Having that second shot makes these kinds of illusions much more interesting! Yeah. It keeps all the naysayers from crying foul, calling it photoshopped. Very effective! — especially since the photographer got the viewing angle right in the first shot to make it work properly. (It’s a pity how often they don’t and ruin the whole illusion). Amazing, absolutely amazing. I love it so much! THE best I’ve ever seen.